Spring has really started now, and in a month or so it will be elderberry blossoms time! You can find Elder-flower in a lot of places along the side of the road, they are very fast growers and give lots of flowers that produce a fresh smell that you can bottle as a syrup and even turn into Elder-flower champagne with a very little bit of alcohol. 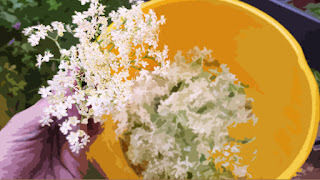 Pick enough elder-flowers to fill a 5 liter pan or bucket, and add 5 liter water and 500 gr. sugar, a handful of raisins and a whole lemon in pieces. Do not rinse the flowers beforehand, this will leave less flavor. The more pollen the flowers have the better the taste. Cover bucket with cloth and set aside for a few days, stirring occasionally. To make syrup pick about 20 (or more!) 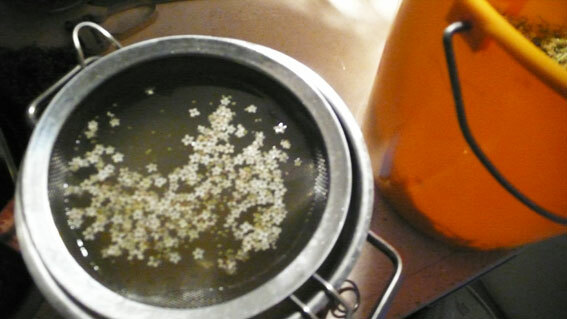 elderberry blossoms when they are open and full of pollen and put in a bucket with enough water to keep them fully submerged. I usually put a plate on top to keep them under water. 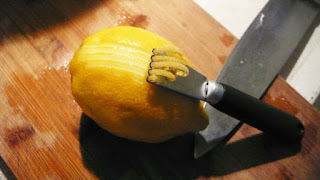 Add a sliced lemon to the water and leave for a night and a day. Then pour through a sieve into a pan and add a generous amount of sugar, at least about 500 gr. per liter. The sugar will make the syrup sweet but also conserve it, so don't try to be healthy and use too little. You will need less syrup when you use enough sugar to make it. Cook the mixture to allow the sugar to dissolve fully. Close bottles and set aside for later use. After opening a bottle keep refrigerated. Pour some cold water in the pan that you used for cooking and drink your first syrup immediately, it has a very delicate and good taste! portrethokje photo's, a set on Flickr. Museum night in Rotterdam: My portrethokje was located at Museum Rotterdam, at the entry of the exhibition Family Portrait, I drew 46 visitors from 20 until 2 o'clock in the morning. Tijdens de museumnacht stond mijn portrethokje bij Museum Rotterdam, bij de tentoonstelling Familieportret. Ik heb tussen 8 en 2 uur 46 mensen geportretteerd. Alle foto's worden zsm op deze blog geplaatst, bent u zelf geportretteerd en wilt u de foto op printformaat hebben? stuur een mailtje naar odrada(at)box.nl. bedankt allemaal, het was een super avond!